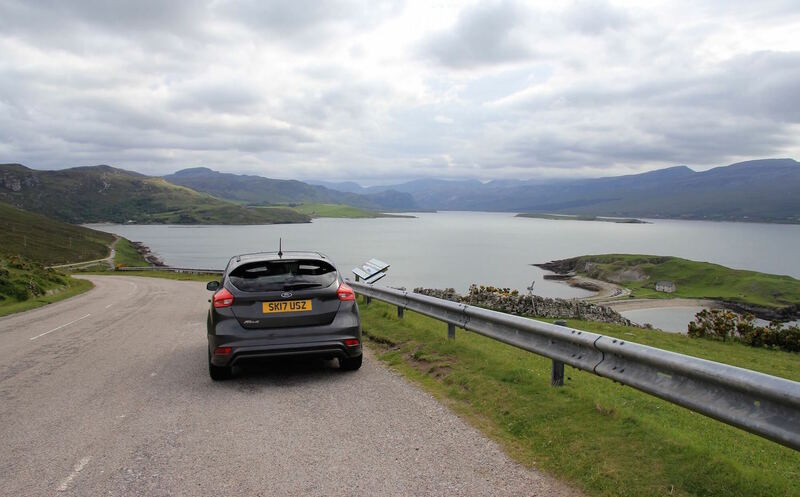 Driving Scotland’s North Coast 500 – a 500-mile route through the Scottish Highlands – was one of the best travel experiences of my life. I made the trip for work (my job at LINKS Magazine), and wrote about my experiences extensively both on the LINKS website, and in the digital and print magazines. This post is different. I’m writing this as a guide for golfers and travelers who want to drive the North Coast 500. I address the most common questions I’ve received, I outline my trip, and I explain what I’d do differently. I don’t go into descriptions of the courses I played, but instead I link to my in-depth reviews. I also feature as many photos as possible from the trip – I hope you enjoy! I’ve broken the article into the sections listed below and you can click on any section to immediately jump to it. 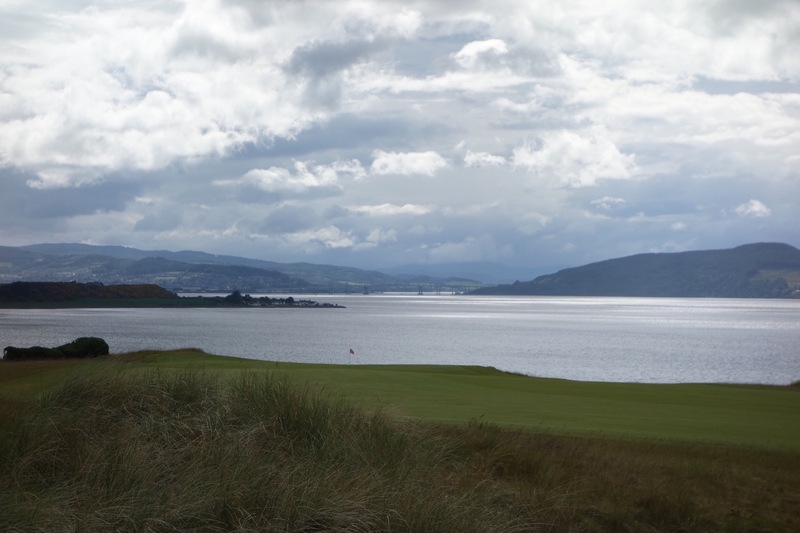 The drive is just as important as the golf on the North Coast 500, and I try to describe the non-golf aspects of the journey as much as possible below. Which direction should you drive the loop? There is debate about whether to drive the loop clockwise or counter-clockwise. I did the trip in a counter-clockwise route, first driving up the east coast of the Highlands before traversing west and driving down the west coast. I recommend that you do the same. The most dramatic sections of the trip, along with the most difficult sections of the drive, are found on the west coast. Starting up the east coast provides a nice “warm-up” for what’s to come and also saves the “best” sections of the drive for last. Do you need to book ahead for accommodation and golf? Yes. 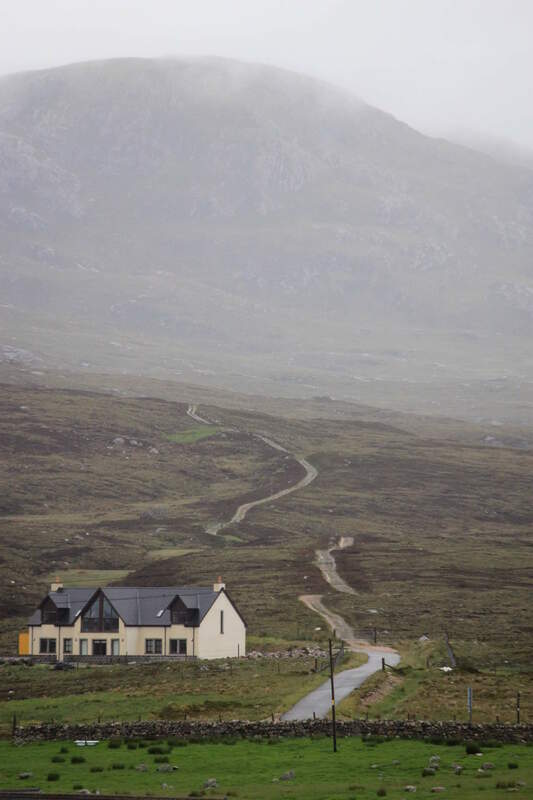 Although this is an extremely rural part of Scotland, the popularity of the North Coast 500 means that accommodation fills up quickly. You definitely need to book ahead. Golf, on the other hand, is a mixed bag. At courses like Royal Dornoch, Castle Stuart, and even Golspie and Brora, booking ahead is smart. 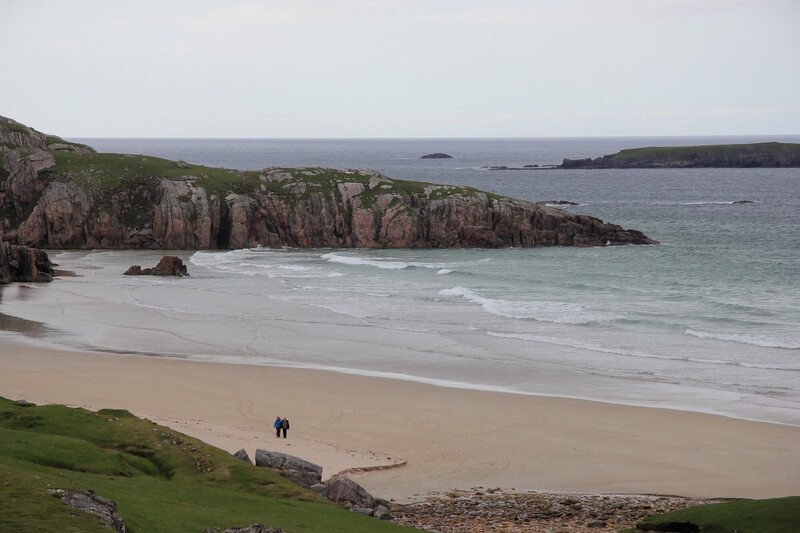 However, at Reay, Durness, and Gairloch, booking ahead isn’t necessary. At those smaller courses there is even an “honesty box” where visitors drop their greens fees since the clubhouses aren’t usually staffed. How long should I spend on the drive? I spent a total of 7 days on the drive, the last of which was a day in Inverness. I thought my timing was great, but next time I would divide my time more equally between the east and west coasts. I spent more time on the golf-heavy east coast of the journey. It made for a very fun trip, but I wish I’d spent more time exploring the more rugged and dramatic west. It would have meant one fewer golf day, but I’d do it in a heartbeat. 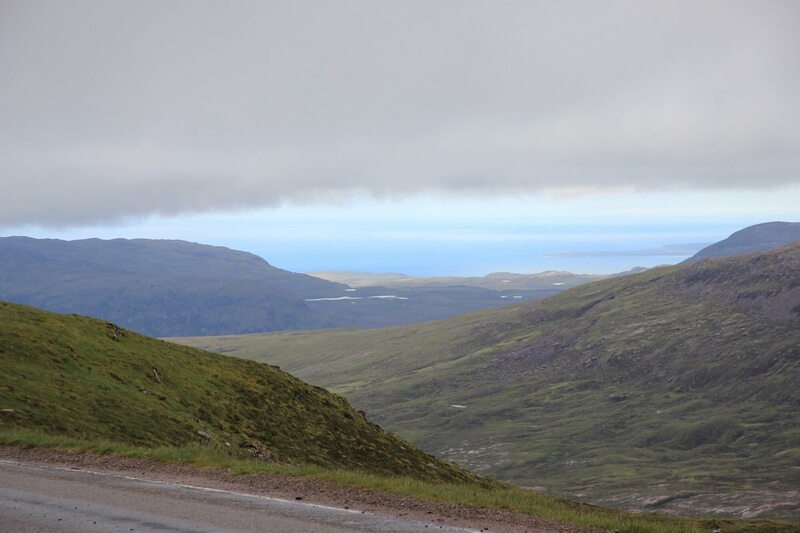 I drove the North Coast 500 in June, which I think is the best time of year to go. June has the longest days (sun sets around 11:15PM mid-June), some of the best weather, and less of the high-season tourist traffic. During my journey I had periods of rain, but beautiful sunshine prevailed for most of the trip. July and August, while typically warmer, don’t promise better weather than June and are typically much busier due to summer holidays. 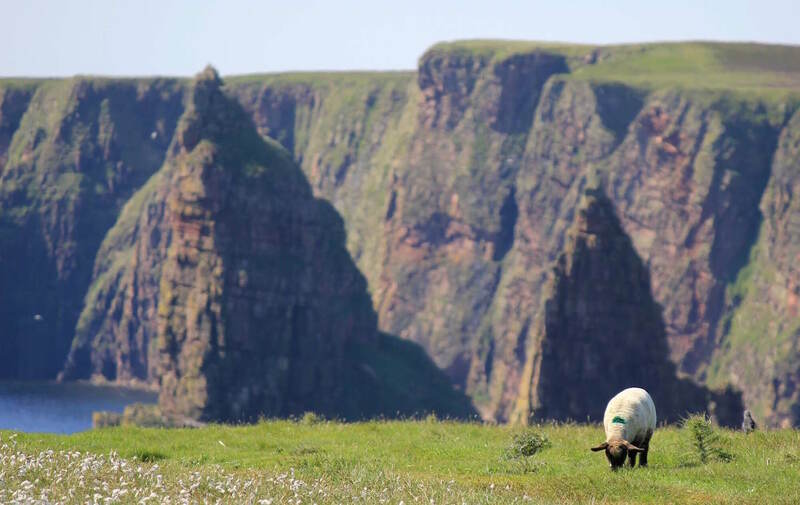 There is never a promise of good weather in the rural north of Scotland, but the summer offers your best chances of sun. April, May, September, and October can certainly be nice, but you’re almost guaranteed cold temperatures. Cold and wet conditions on the small, twisty, and wild roads of the North Coast 500 isn’t anything I’d want. We’ll touch on that more in the safety section. This style of driving can sound intimidating, but you get the hang of it! My aim is to convey the seriousness of the task – it isn’t my aim to scare anyone off… You’ll pick it up quickly and the tough drive is enormously rewarding (just look at these views)! 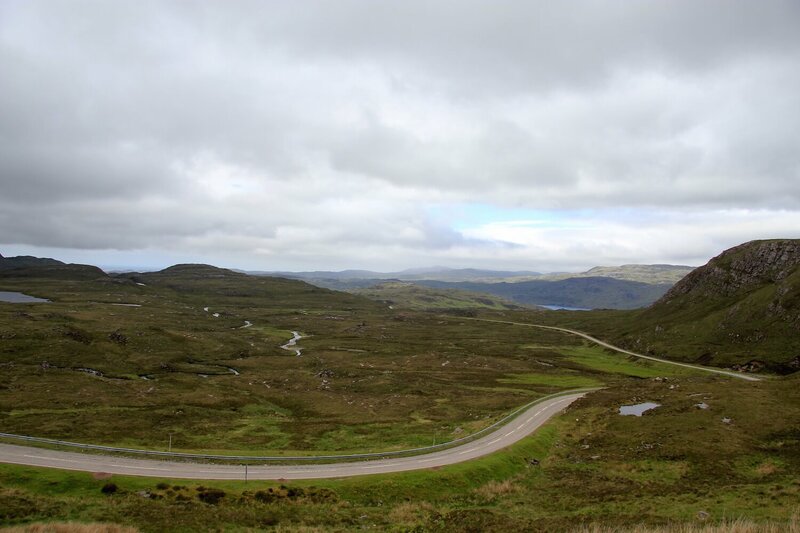 A number of large sections of the North Coast 500 route take place on single track, or single lane, roads. Single lane roads require extreme attentiveness and a knowledge of driving etiquette. The key to success is always looking for the next passing place further down the road. The passing places are small paved or gravel “pull-offs” that provide room for one car to pull off while the other drives past. In some areas there are passing places every 50 or so yards, but in other areas they’re further apart. In most cases they’re marked with signs. You always need to watch for oncoming traffic and be ready to immediately pull off into the correct passing place. You can imagine the danger of driving on unknown winding, sometimes wet, roads when someone appears around the blind bend flying your direction! One final passing place note, “pull off” isn’t always the correct term to use. When driving on a single lane road and the passing place is on the right, the correct etiquette is to slow down and stop in the road, directly beside the passing place. The oncoming car then drives around you, using the passing place on your right. Think about the road as if it was two lanes. You drive on the left side of the road, so pulling into a passing lane on the right is the equivalent of pulling into oncoming traffic. Also use the passing places to let faster traffic pass you. We’re tourists on these roads and while we may enjoy soaking in the views or simply driving slower for safety, there are locals trying to get places! Always let people pass. 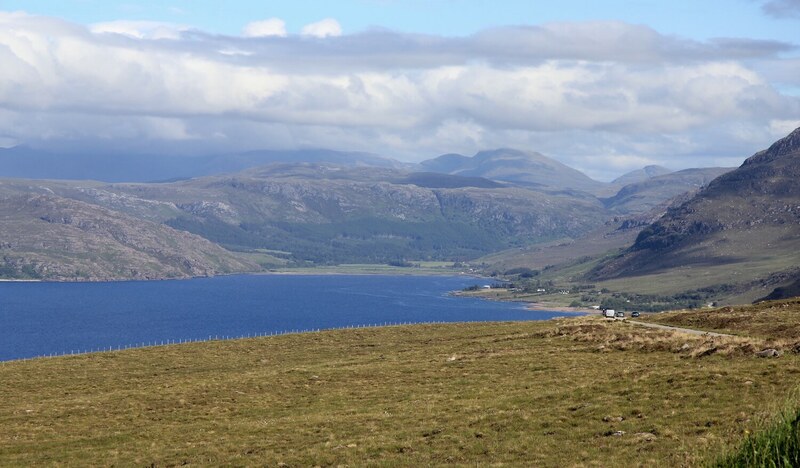 The North Coast 500 route follows the coastal roads throughout the rural Highlands. Google Maps, while useful in many instances, is programmed to show the fastest and most direct routes. Blindly following Google Maps can mean you miss sections of the drive where you unknowingly bypass areas as the app takes you to your destination. 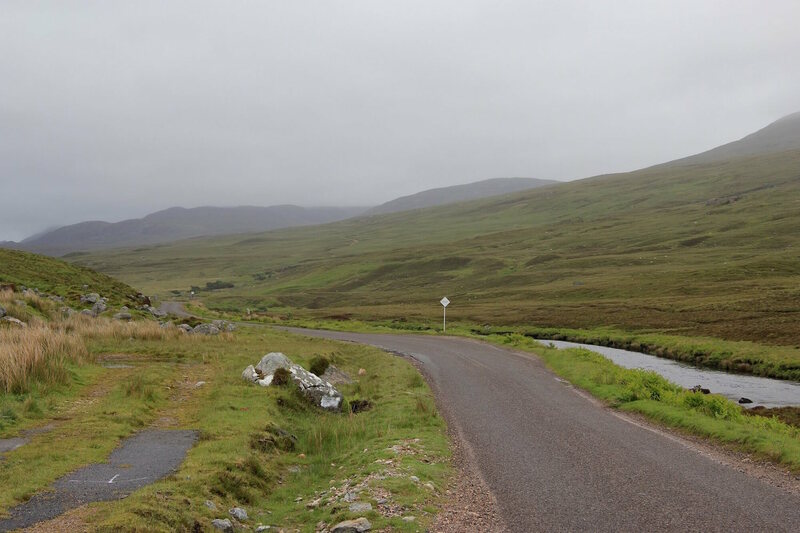 I suggest using Google Maps in conjunction with a North Coast 500 map, which is available for free at tons of hotels, restaurants, and other stops along the route. Also keep in mind that you won’t have cell service for much of the journey. I used Google’s “offline maps” feature where I downloaded a map of the Highlands for the journey. I drove the route alone, which admittedly was a challenge. I was in a manual car, on the winding rural roads, trying to cross reference Google Maps and my paper map, while taking in the breathtaking views. A key was bringing a dash mount for my iPhone, which allowed me to quickly reference my phone map. The UK also has very strict phone use while driving laws, so it’s a must-have accessory. If you can, drive the route with a partner! It is an experience you’ll never forget and sharing that with someone would add to everything. Plus, having a navigator/co-driver would makes things less stressful! There are long sections of the trip that don’t pass a gas station. This is true particularly on the west coast of Scotland and I took a friend’s advice to fill up every time I dipped below half a tank. I’m not sure what you would do if you were stuck on the road, out of gas, with no cell service. You can plan your gas stops using this Google Map where they’re all marked. Finally, car choice can play a large role in your enjoyment of the trip. I chose a manual Ford Focus ST and it was the perfect size and perfect amount of power. A bigger car might mean you could accommodate a larger group, but it could make the drive difficult or even impossible in spots. 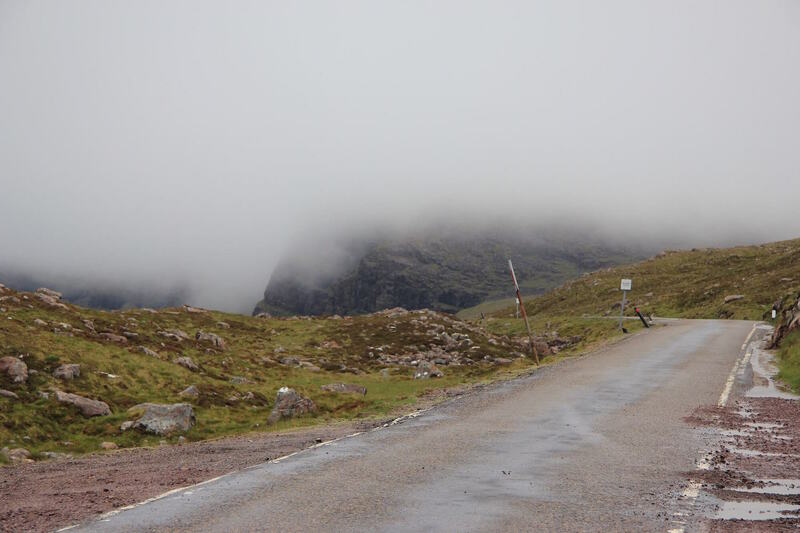 Certain sections, like the Bealach na Bà (Applecross) mountain pass is off-limits to large vehicles. Also remember that most UK rental cars are manual transmissions. 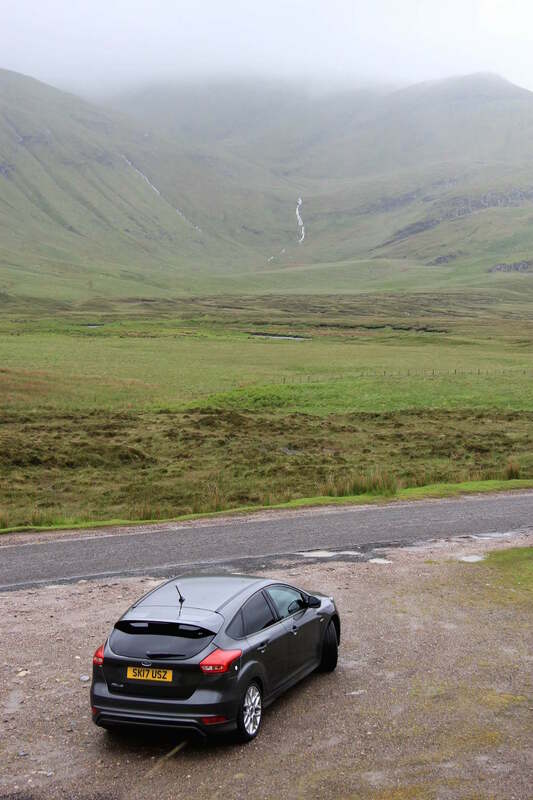 If you don’t know how to drive a manual, the North Coast 500 is not the place to learn! Designate that you want an automatic at the time of rental car booking. 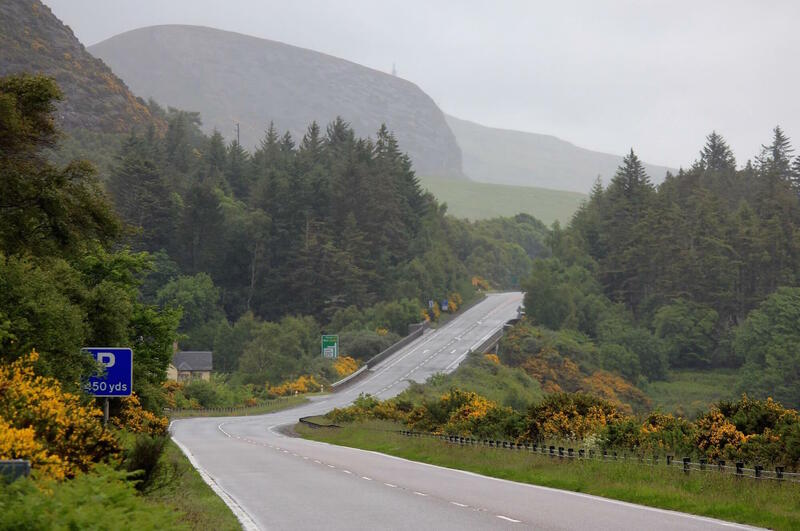 The drive from Inverness to Royal Dornoch is a simple one on a main road. 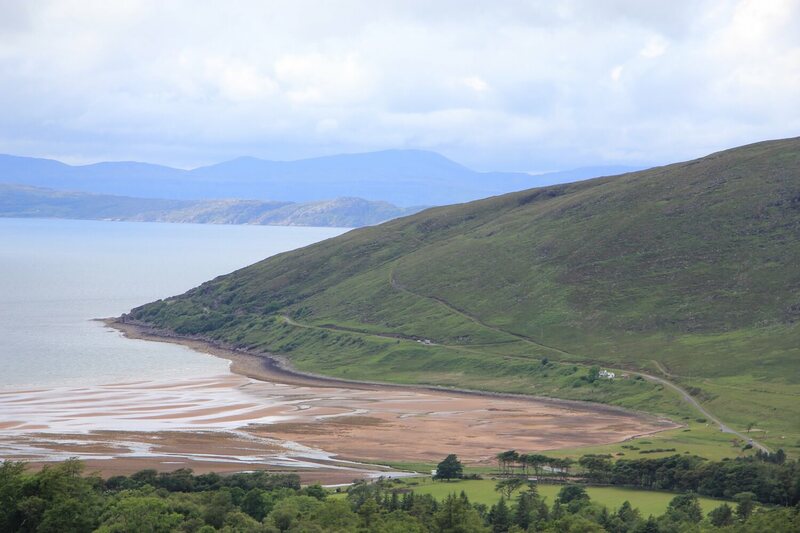 There are pretty views as you cross the Dornoch Firth, but they don’t compare to what you’ll see later in the trip. 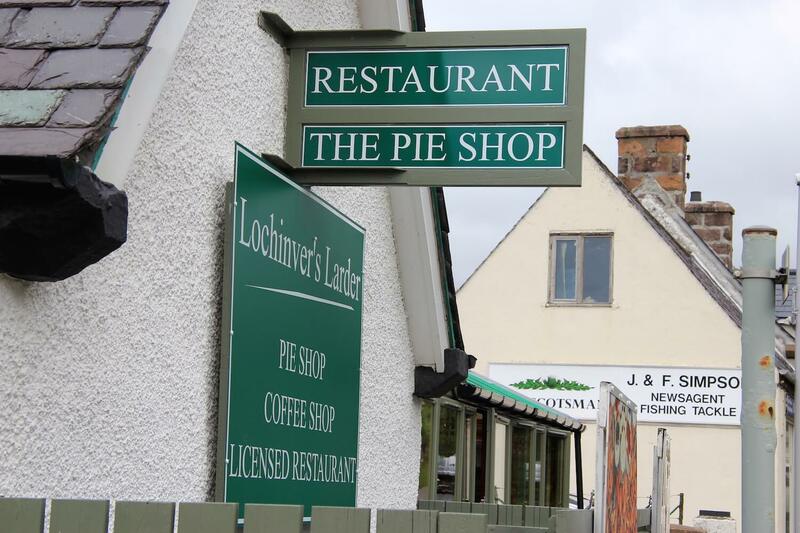 Arriving into Dornoch is the special part of the drive. 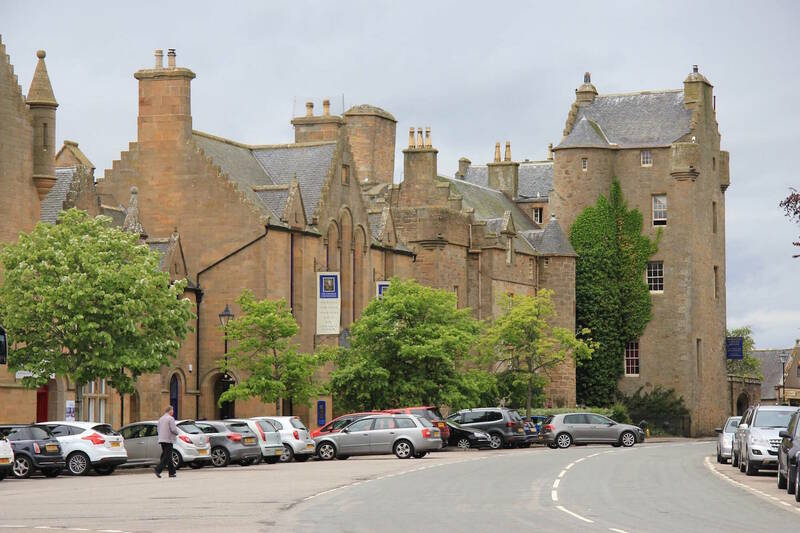 The old Scottish city has real charm and as you pass through the center of town on your way to Golf Road and Royal Dornoch, the excitement builds. 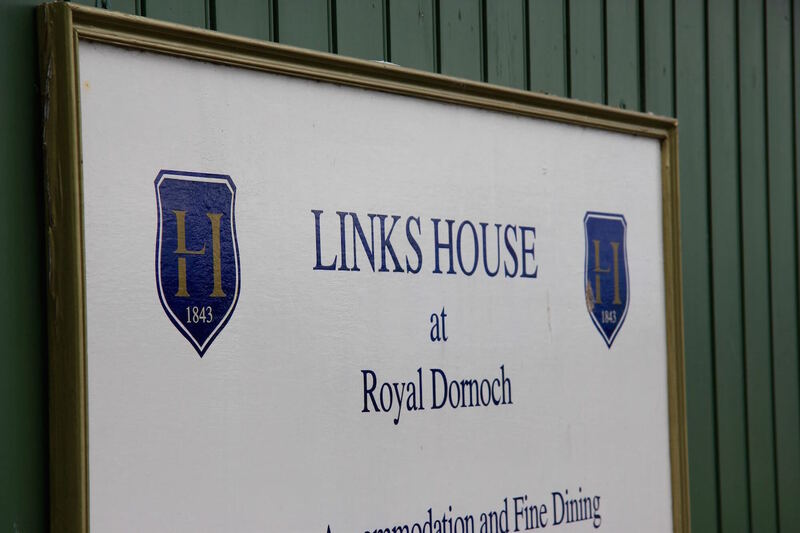 I stayed at Links House Dornoch – a beautiful guest house-type hotel just a few yards from the first tee at Royal Dornoch. 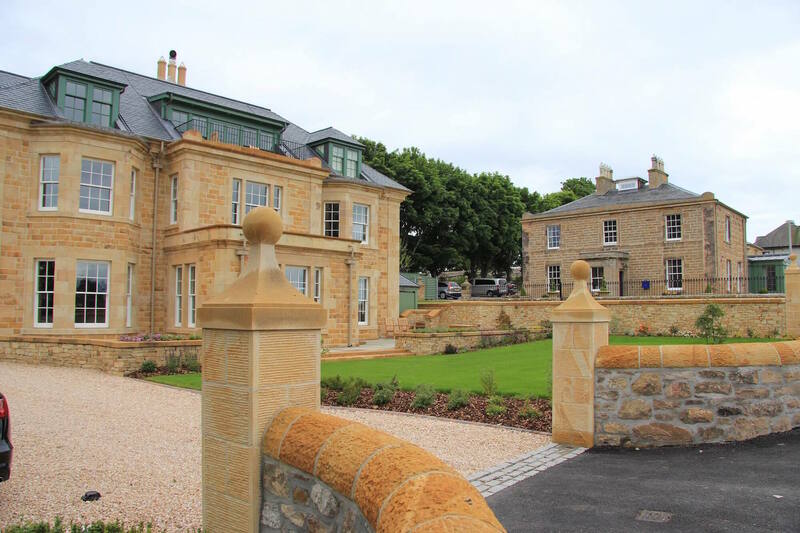 American Todd Warnock and his wife own Links House and they’ve done a great job of marrying luxury with a traditional Scottish experience. 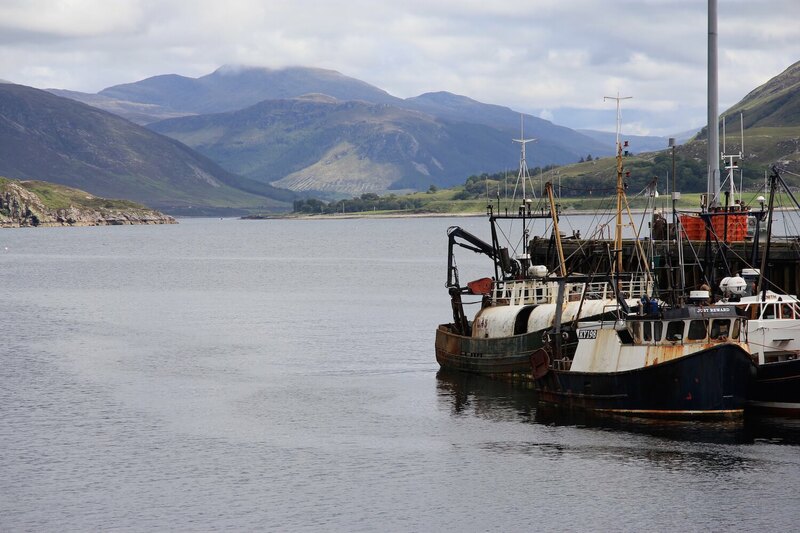 The walls of the guest house are filled with maps of Scottish rivers, fishing gear, and other Highlands memorabilia. Notably missing is anything golf-related. Todd told me this was to encourage his guests to explore Scotland beyond the golf courses. I’m doing the same with this article and I hope you guys take our advice! 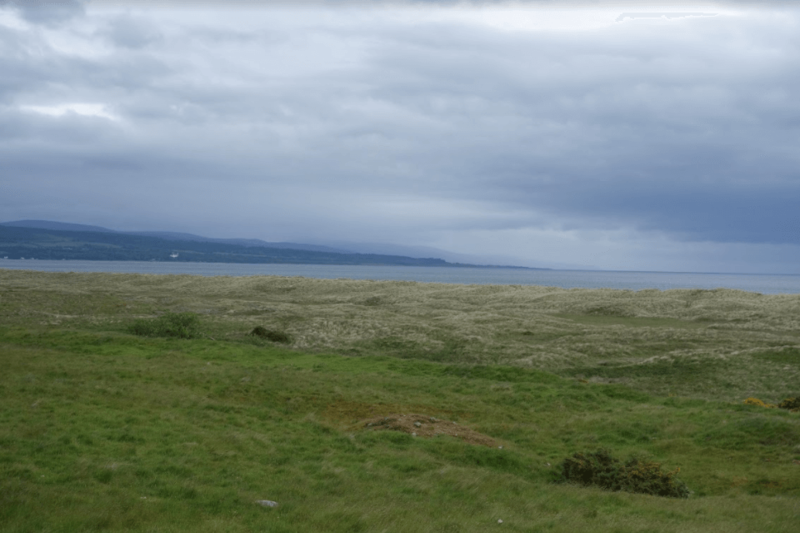 I woke up early on Day 2 and played Royal Dornoch again – this time in a driving rainstorm. Even in those terrible conditions, the course was a joy to play. Admittedly I prefer the peaceful evening rounds, but rain in the morning wasn’t too bad. On a different note, I want to draw attention to an interesting and turbulent part of Highlands history – the Highland Clearances. 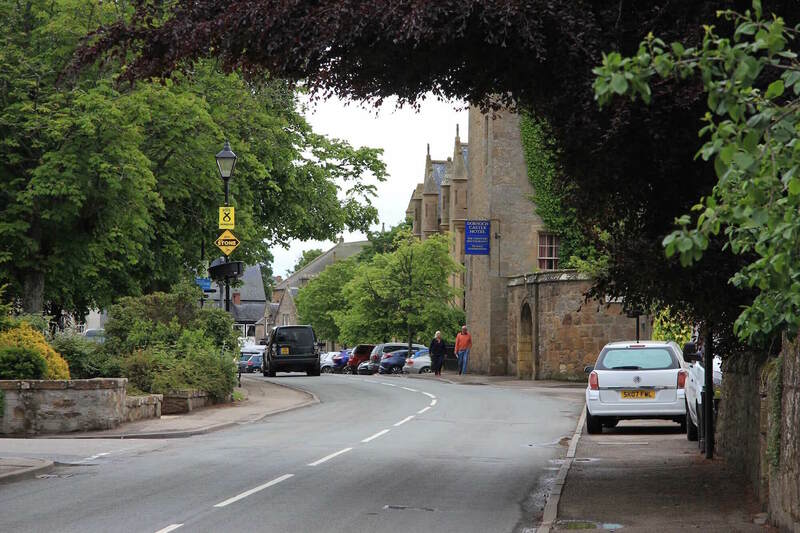 The drive from Dornoch to Brora provides the first glimpse of Clearance history when throughout the drive you can see a large statue on top of a hill in the distance. The monument is a 100-foot-tall statue of the Duke of Sutherland on top of a Ben Brahggie, a mountain overlooking the town and links of Golspie. I strongly suggest reading up on the Clearances, which deserve much more than I’ve written here. 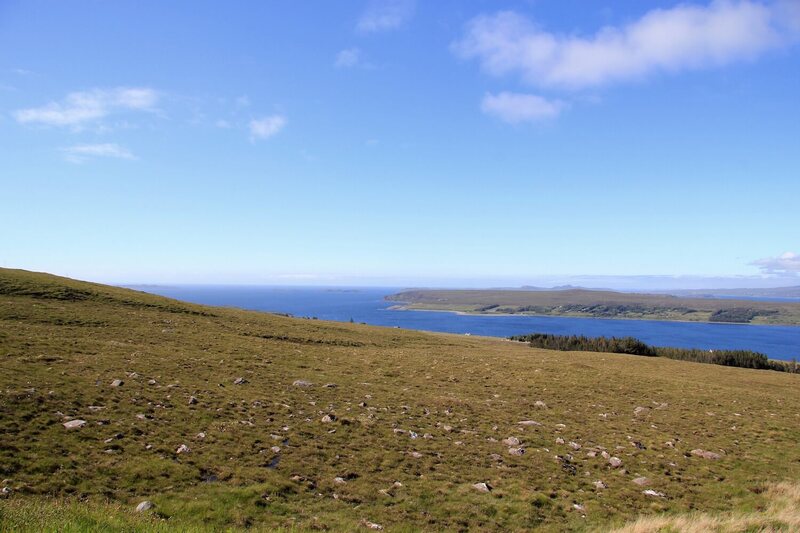 The brief overview is that in the late 18th and early 19th centuries, the first Duke of Sutherland cleared all of the tenant farmers off of his land, resettling them in coastal villages to make way for sheep farming. The farmers were forcibly removed from their homes and the period that followed was filled with death, famine, and the emigration of Scots to the Lowlands, America, and other parts of the world. These forcible and sometimes violent evictions happened all across the Highlands. It is a dark period of Scottish history, and once you’ve read about the Clearances, the huge statue watching throughout the drive and time around Golspie feels dark and eerie (you can see it on top of the hill in two photos below). 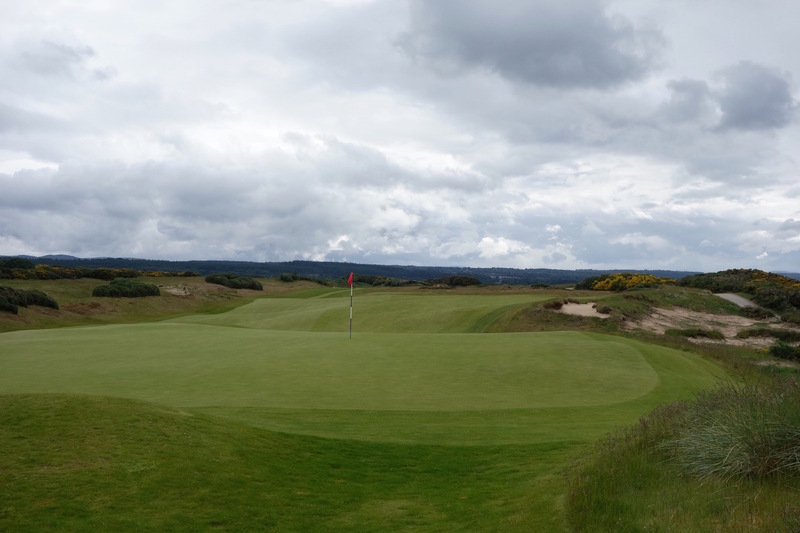 Day 3 was a 36-holer at Brora Golf Club and Golspie Golf Club before making the drive to Ackergill Tower, which you see in the photos below. 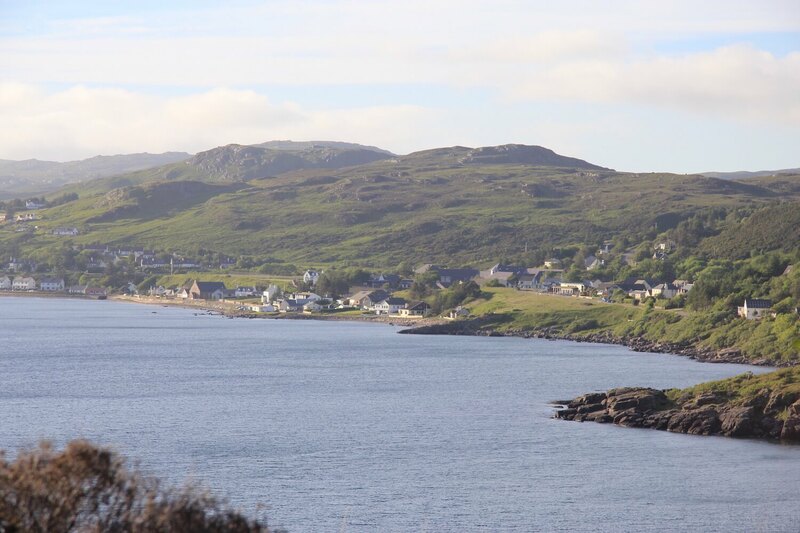 This is where the North Coast 500 drive really starts. The roads start to get smaller and higher above sea level, the views longer, and everything begins to feel much more rural. The route takes you past small villages and towns until you reach Wick, which is a larger settlement. I drove past Wick until I reached a sign for Ackergill Tower, my accommodation for the night. Anticipation builds on the straight mile-long driveway to the castle that opens up to a stunning view at the bottom. I had totally underestimated the scale and sense of occasion at Ackergill Tower. 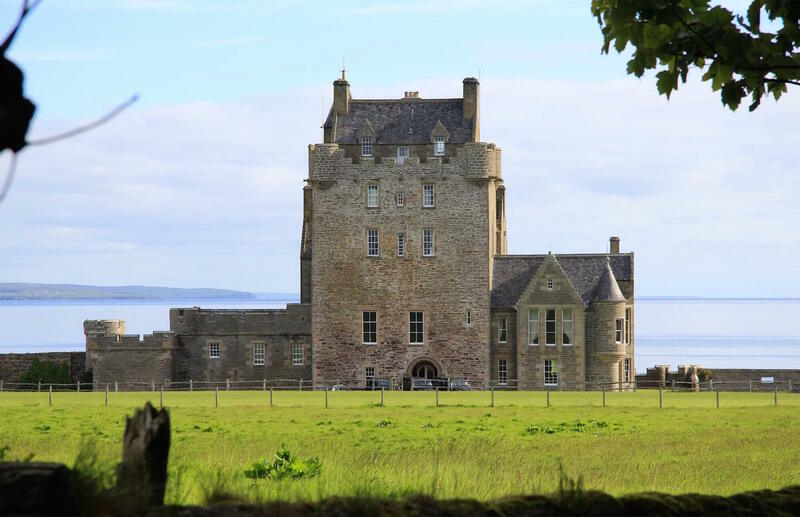 The history of Ackergill Tower dates back to the mid 1300s. Like many castles across Scotland, Ackergill was neglected over the centuries and it fell into disrepair in the 18th and 19th centuries. The owners began to sell off parts of their 100,000-acre estate to pay for repairs and upkeep. The estate eventually dwindled to 4,000 acres and the property was sold to a family who undertook a major renovation project in the 20th century. They then sold it to the current owners who turned it into a 5-star hotel. I’ve just summed up 700+ years of history in a paragraph, so read about the history on their website if you’re interested! The coolest part of the experience was that I didn’t stay in the castle at Ackergill Tower. 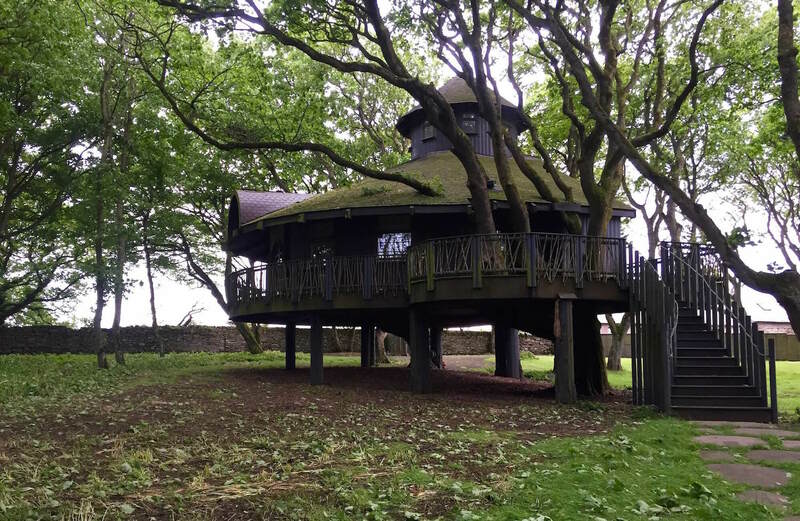 Instead, I stayed in their treehouse… Yes, a treehouse. It’s on a secluded part of the property and meant I had my own home – not a room – for the night. 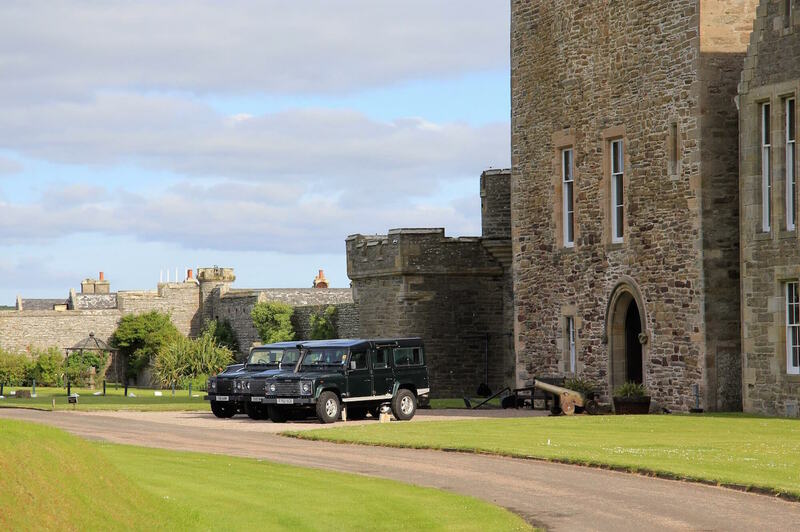 The hotel offers shooting, falconry, fishing, and more on the estate and classic Land Rovers drive everyone around the property. 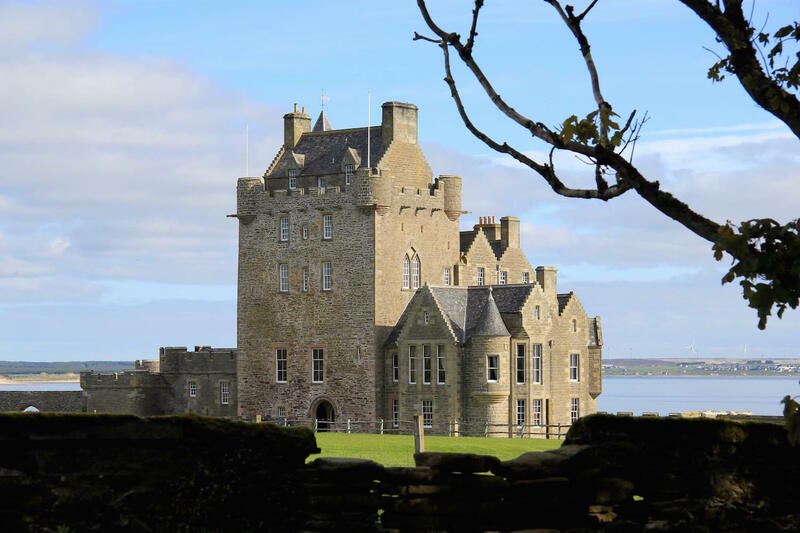 Ackergill Tower was the biggest and best surprise of the North Coast 500. 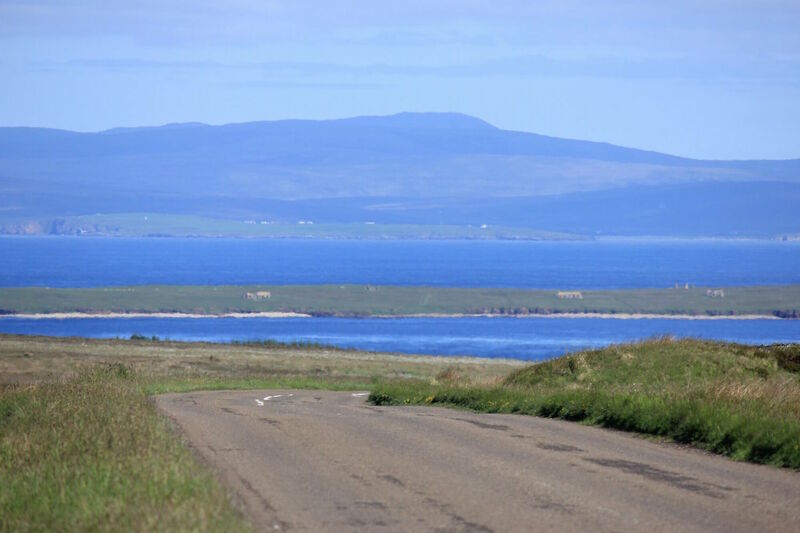 The real beauty, drama, and rurality of the journey begins on Day 4, but it starts with a gentle drive to John o’ Groats – the most northerly settlement on the British mainland. 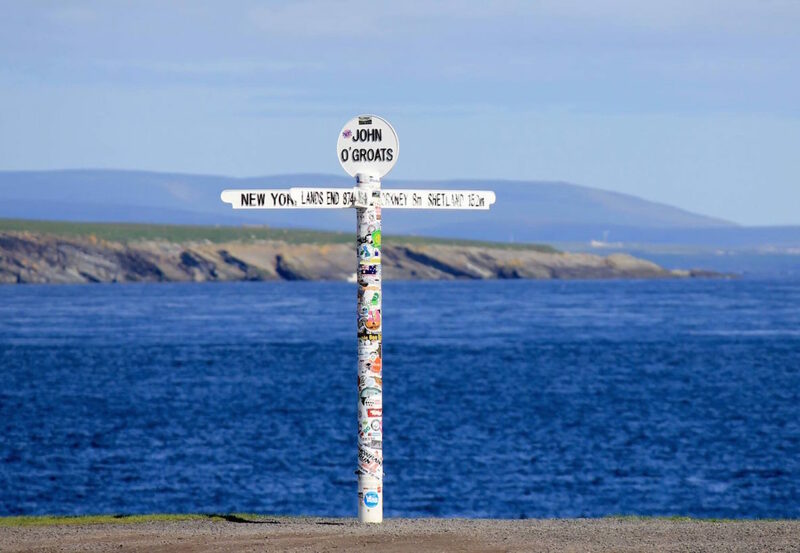 It’s a touristy spot and everyone wants to take a picture with the famous John o’ Groats sign, but it’s worth seeing for yourself. Beyond the sign you can see the Orkney Islands. Just outside of John o’ Groats is Duncansby Head, where you can see the lighthouse and Duncansby Stacks, a grouping of rocks jutting up from the sea. It’s a gorgeous spot for photography and would be perfect for a picnic! 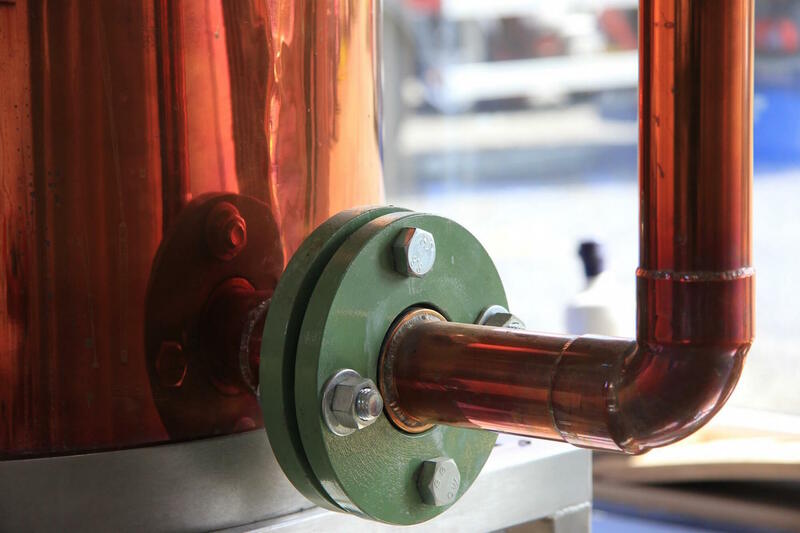 My next stop was the town of Thurso, and particularly a distillery known for it’s award-winning gin (they also produce a tasty vodka). 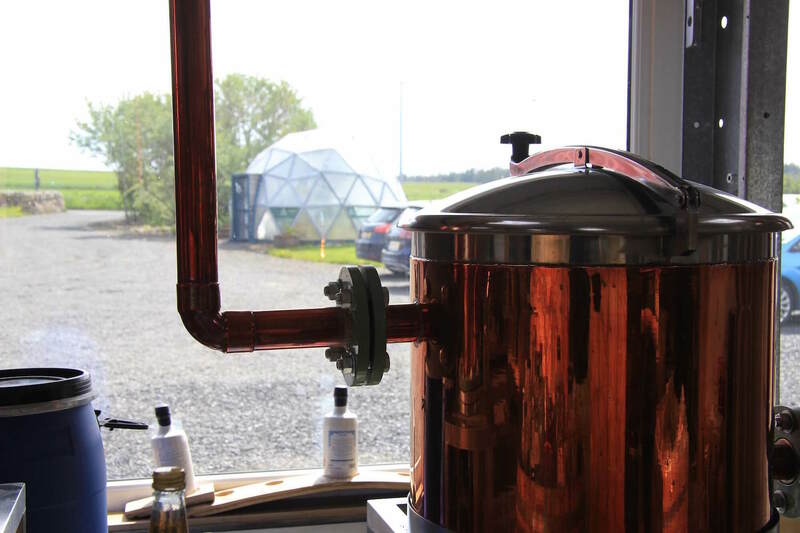 Dunnet Bay Distillers have a small setup near Thurso that is teeming with energy. 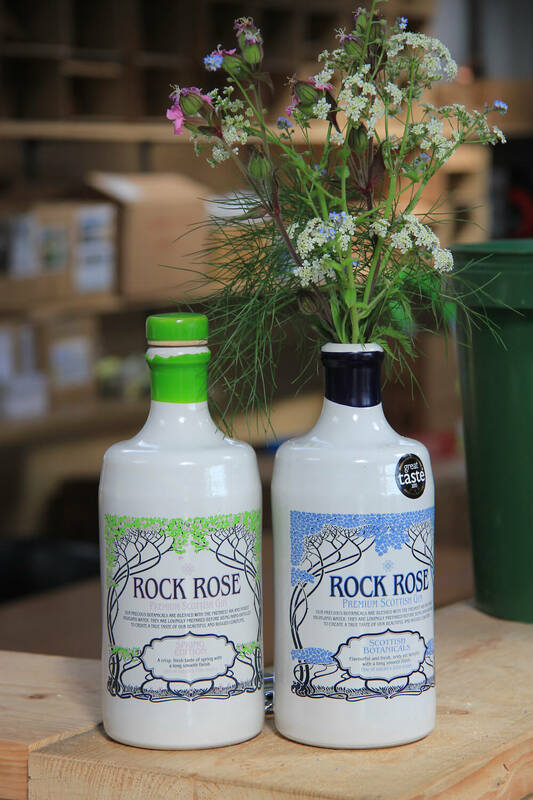 They produce Rock Rose gin, which is packed with botanicals from the local area. 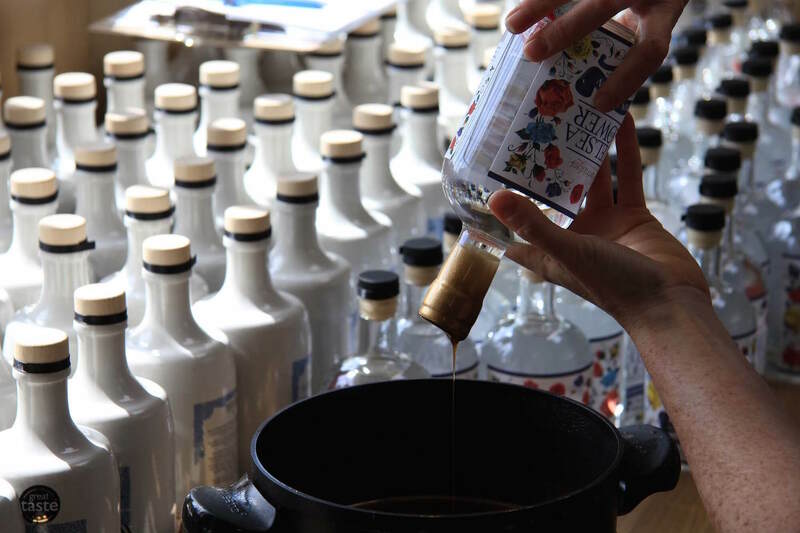 As with other parts of the world, there has been a gin renaissance in Scotland, and Dunnet Bay has taken advantage. 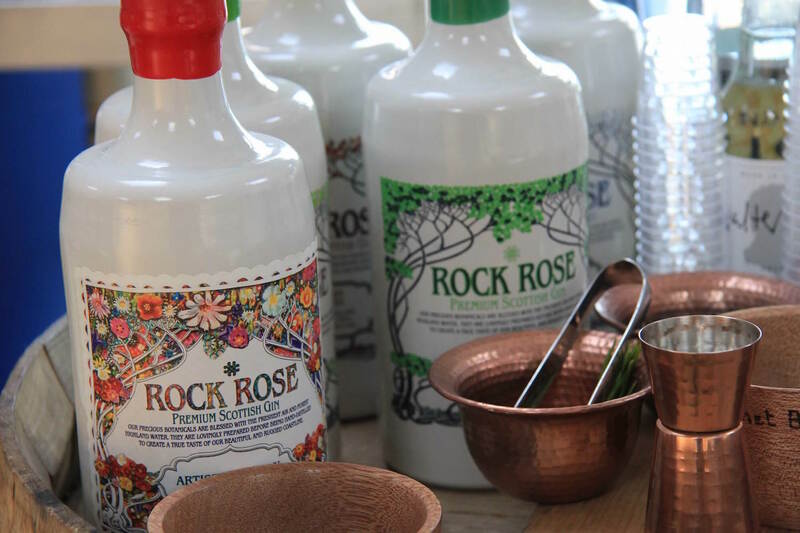 Their ceramic bottles can be found at in-the-know bars throughout the UK. I took a tour of the facility, made a few purchases, and even got to wax-seal a couple of bottles! It’s absolutely worth the stop. After the distillery I stopped in Thurso for lunch and began the most rural part of the drive yet to Reay Golf Club. Read more about it in the review, but Reay was a very fun and difficult round in a tremendous setting. The route beyond Reay provided my first glimpse at single-track roads (reference the road safety part of this article!). 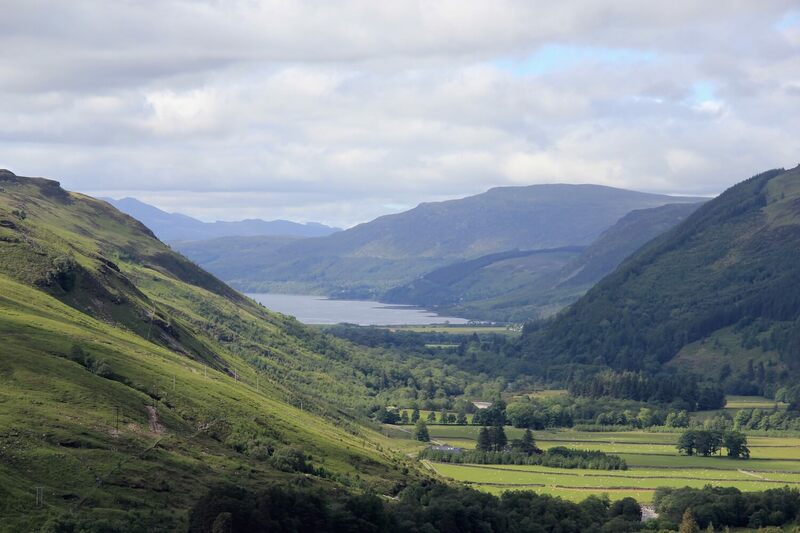 It’s also where the route begins to climb through the Scottish Highlands hills, dipping down beside lochs, up over ridges, and through valleys. I made it to the town of Durness just before dinner and I let out a deep breath once in the parking lot of the Smoo Cave Hotel. It was the hardest drive I’ve ever done, but by far the most beautiful and rewarding! I knew I was in for a treat when someone messaged me, “If you thought today’s drive was the best you’ve seen, just wait for tomorrow. I knew from reading the North Coast 500 guide that Day 5 would be the most technical and difficult drive yet. With that in mind, I woke up, played an early round at Durness Golf Club, stop at Cocoa Mountain Chocolatiers to grab a hot chocolate and some gifts, and proceeded to hit the road. 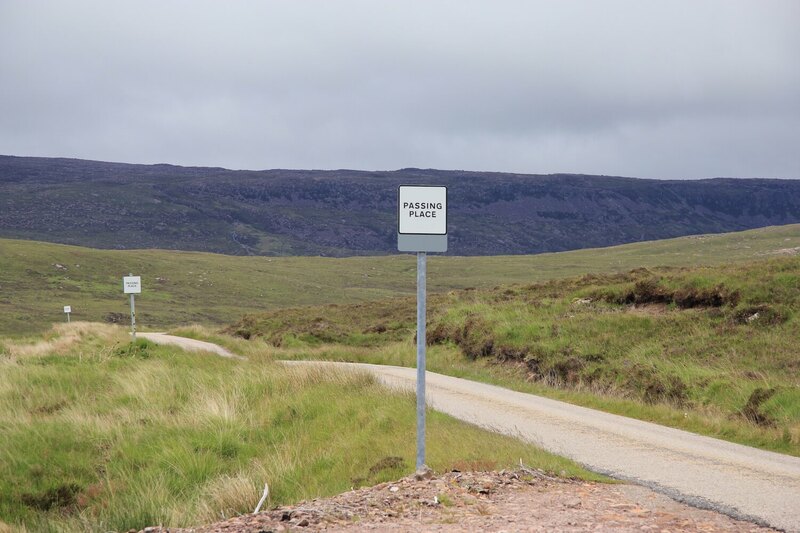 The first third of the drive is on single-track roads, winding past lochs and through valleys where I could have stopped to take photos every 5 minutes. 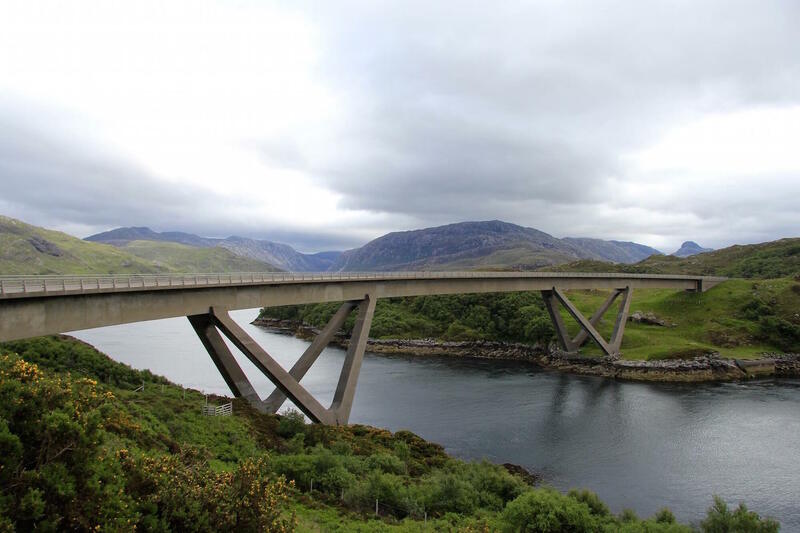 I meandered my way through the Highlands down to one of the landmarks of the drive – the Kylesku Bridge, opened by the Queen in 1984. Up to that point, the only way to cross the Loch a’ Chàirn Bhàin was a ferry. 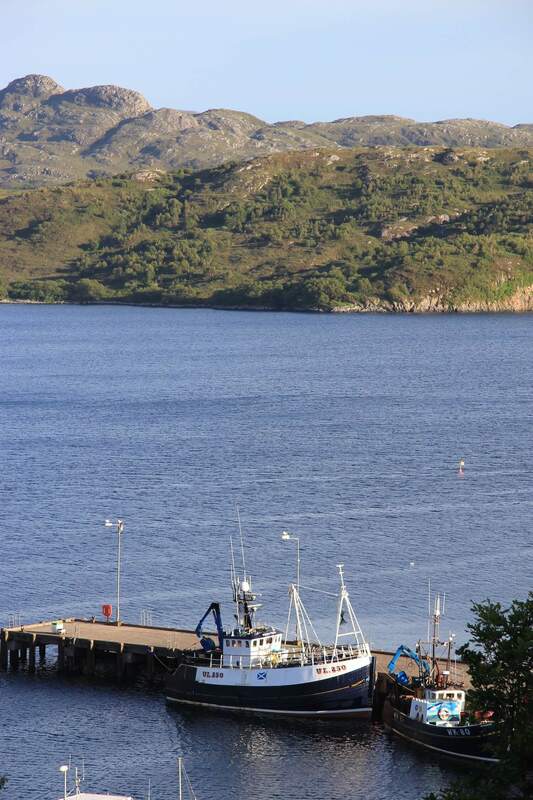 Beyond the bridge my aim was to reach the Highlands fishing town of Lochinver to have lunch at the Lochinver Larder Pie Shop (highly recommended). The small pie shop was slammed busy on the Saturday at noon, so I took my pies down to the harbor where I happily ate with one of the best lunch views you can find. 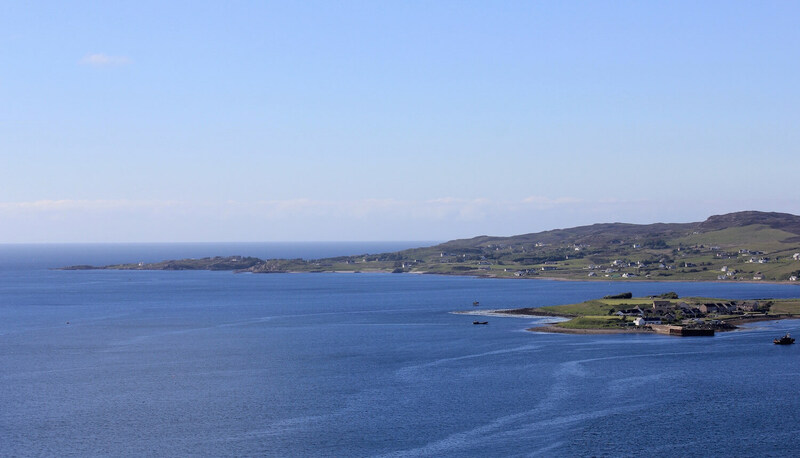 The route then winds past Ullapool, one of the biggest towns in the Highlands and also the main ferry terminal for the Outer Hebrides, and down to a point where you turn off a main road to meander toward Gairloch. You enter the Corrieschalloch Gorge National Nature Reserve for the last stretch of the drive, which is yet another stunning area as you’ll see in the last set of Day 5 photos below. A wet morning round at Gairloch Golf Club started the final day of the North Coast 500 drive. Prior to my trip, I had read numerous articles and a guide book on the journey, and this final day was the one I most anticipated. There was also a decision to be made. 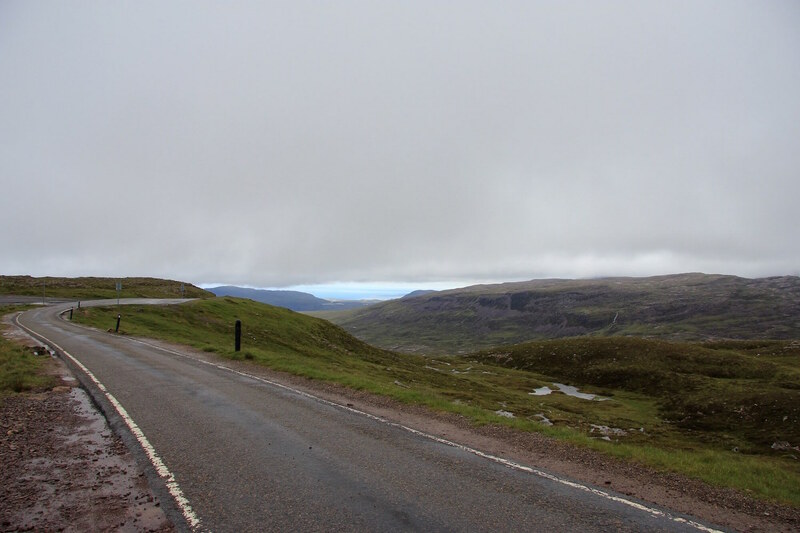 Drivers can either take the route via Applecross, Scotland, which means driving the Bealach na Bà pass, or they can bypass Applecross and drive straight to Inverness. During the cold, wet round at Gairloch in the morning, my host warned me not to take the pass because it would likely be fogged in. After some thought and time spent looking at the map, I decided to take on the challenge and drive to Applecross. How could I not after coming all that way?! I ate lunch at the famous Applecross Inn (have the fish and chips with a pint of ale), and got back on the road. The mountain pass was cut in 1822 and it is the third-highest in Europe going from sea level to 2,054 feet via tight hairpin switchbacks, all on a single track road. I wasn’t able to get out at any point to take photos of the switchbacks, so check them out here. Fortunately, the clouds had lifted slightly and I had good visibility. As tempting as it is to just soak in the views, the pass is no time to drop concentration. 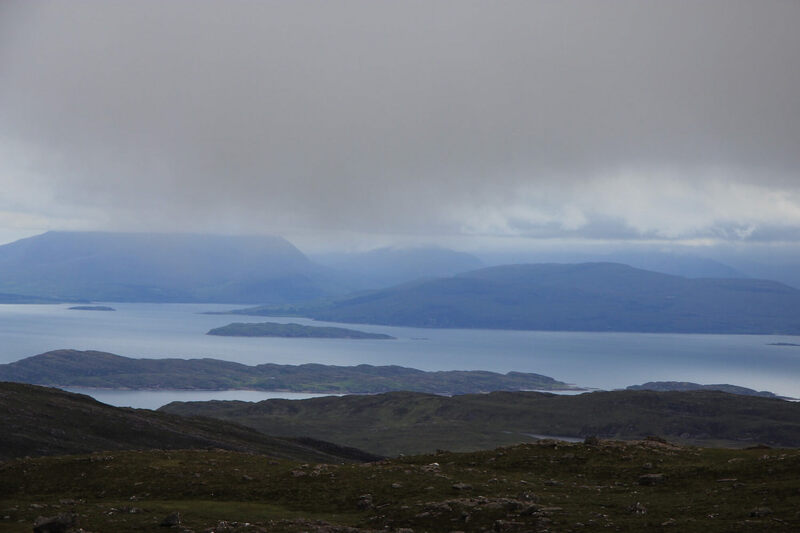 Fortunately, there is an area to stop at the top and look out to the Isle of Skye and Inner Hebrides beyond. Once on the other side, it’s back to two-lane roads and an easy drive back to Inverness. It’s the perfect point to decompress and think back on what you’ve just done – and accomplished – on one of the most beautiful driving routes in the world. I don’t really count this as a day of the North Coast 500 drive, but my final time spent in the Highlands was playing Castle Stuart Golf Links, a course that never fails to impress me. 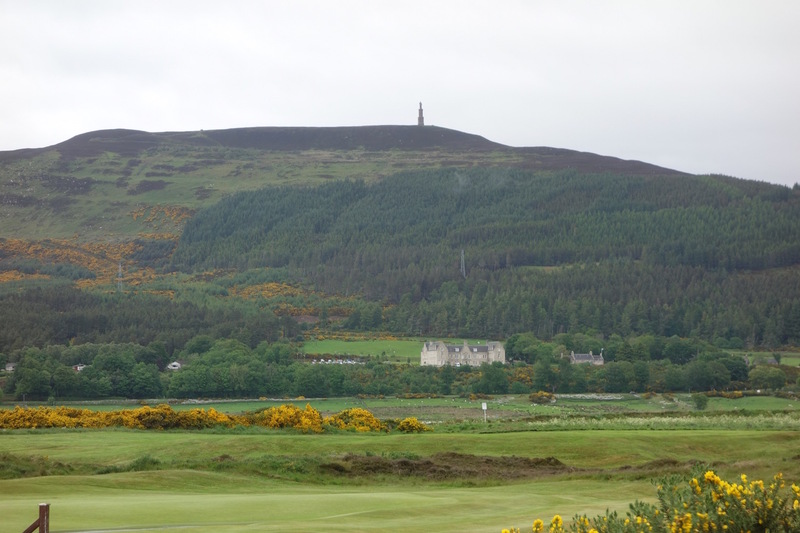 I spent a single night in Inverness at the Kingsmills Hotel, where my luxurious room had a perfect view onto Inverness Golf Club. After a week without cell service where most hotels didn’t have wifi, the Kingsmills was a luxurious experience. Next time I drive the North Coast 500 I will play less golf. One of my only regrets was passing sites like hidden beaches, beautiful viewpoints, castles, and towns, etc., where I would have loved to stop and explore. My alternative wasn’t bad at all – I got to play some amazing golf courses – but next time I’ll explore all of those hikes and destinations I missed. I may not even bring my clubs! On a related note, on my next loop of the North Coast 500 I will spend more time on the west coast part of the journey. The rugged west is mountainous and I wish that I had spent more time taking photographs and hiking in those hills and on those beaches. Since the bulk of golf is on the east coast, that’s where I spent my time. Because of that I had to move quickly down the west coast on the second half of the trip. I’m going to play in a golf architecture group outing at Golspie/Brora at the end of May with a round set at Dornoch. Your trip looks like fun . It remains me of Donegal which I love. Hi Mike, thanks for the comment! I think you’ll love those three courses when you’re up there. I’ve played Donegal as well and there are definitely some similarities. Make the most of your trip up there!! I should have said County Donegal. Can’t believe someone looking to sample golf courses on NC500 would miss out the James Braid Highland Golf Trail ones particularly Muir of Ord awarded Scottish Golf Club of the Year 2016! Shame on you for only doing half a task! Hi Hamish, I can’t say I feel any “shame” for drawing attention to the rural north of Scotland. I’m sorry that my review of the North Coast 500 upset you so much. I was fortunate to play 8 rounds in 7 days, and didn’t have time to add more days. Fortunately, 3 of the 7 courses I played were James Braid designs, so I did get to see a good section of the James Braid Highland Golf Trail. Hopefully I’ll be back soon to see the Muir of Ord and others. A wonderful article and I have had the good fortune to play many of these. The photographs are superb also…well done Graylyn! and for your outstanding podcasts. Hi Randy, that’s a great memory with your father! And an impressive finish from both of you in the tournament. Those friendly members at Tain are what you’ll find throughout the entire North Coast 500 if you’re able to make the trip during retirement. It will be a great way to celebrate a career with your wife! Whenever that day comes, shoot me an email and I’ll give you some tips. In the meantime, I’ll keep the articles coming! Thanks for all of the great content….I especially enjoy your contributions on the Scottish Golf Podcast. I’m an American living in Germany and we’re planning a more family friendly vacation (less golf centered) this June/July on the NC500, but I’m still going to bring the clubs and try and get in a few rounds. One twist, we’ll be renting a family camper allowing us a bit more freedom in stay locations and the chance for me to sneak off for early morning or late evening rounds. Planned for 8 days, we’ll be basing our direction of travel on the weather forecast on arrival. We’ll see how it works out….I’m cautiously optimistic. 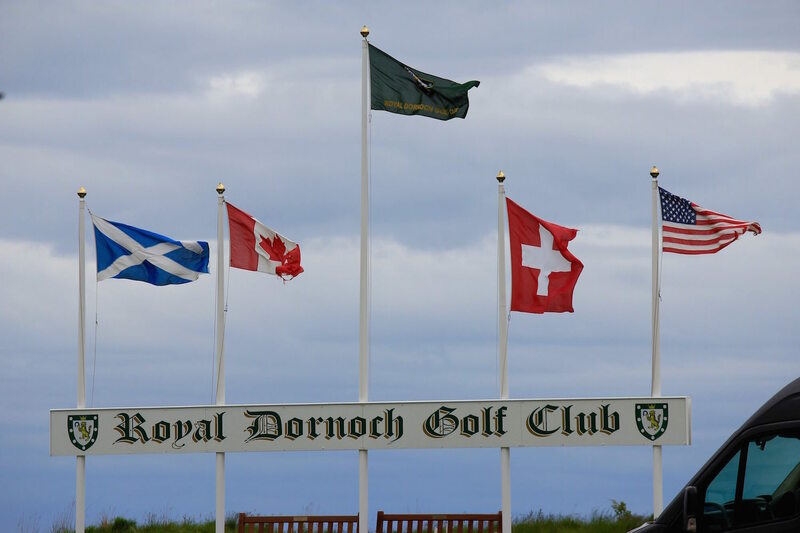 Last year I was lucky enough to play Dornoch, Brora, Golspie and Tain on the Dornoch Firth Golf Pass (great deal BTW), so I’ll probably only try and sneak in a round at Dornoch and maybe Fortrose and Rosemarkie during our camper pickup and drop off days in Inverness. 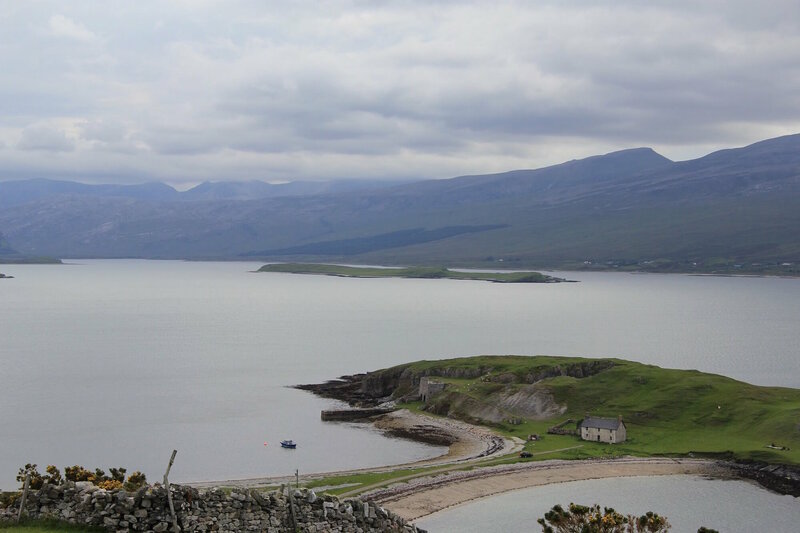 We plan to spend more time on the West coast (as you suggested), but was wondering if you would add or subtract from any of my other planned rounds while on the road: Reay, Durness, Gairloch, Wick and Ullapool? Any other West Coast attractions that you would suggest as a must-see (golf or non-golf related)? I love the sound of your trip! If I could do it again I’d do exactly what you’re doing – eight days, a few rounds of golf, and really just going where the wind (weather) takes you. I’m sure you guys will have a great time. I think you’re spot on with the areas that you listed. I wish that I had spent more time in Wick, which is supposed to be a really nice place. North of there I enjoyed taking some time at Duncansby Head and Duncansby Lighthouse. Had I had more time, I would have gone on a longer hike/walk in that area. When you’re up in Durness, I’d visit Smoo Cave and Cocoa Mountain Chocolate in Durness. 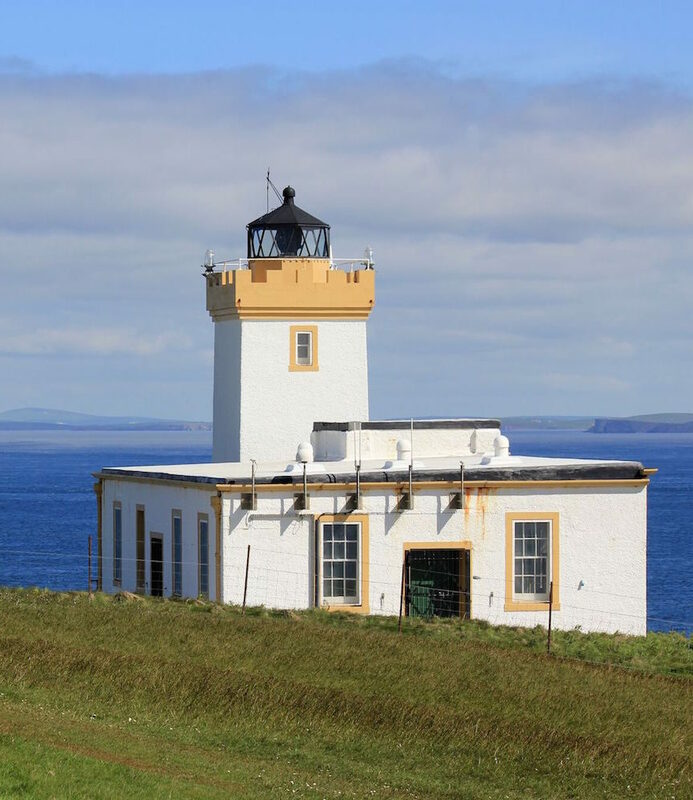 Also while up there, I’d look into the small day trip out to Cape Wrath. I didn’t have time to do it, but it looks like an awesome walk out the a remote point. If the weather is good and you guys like a walk/hike, definitely consider it. 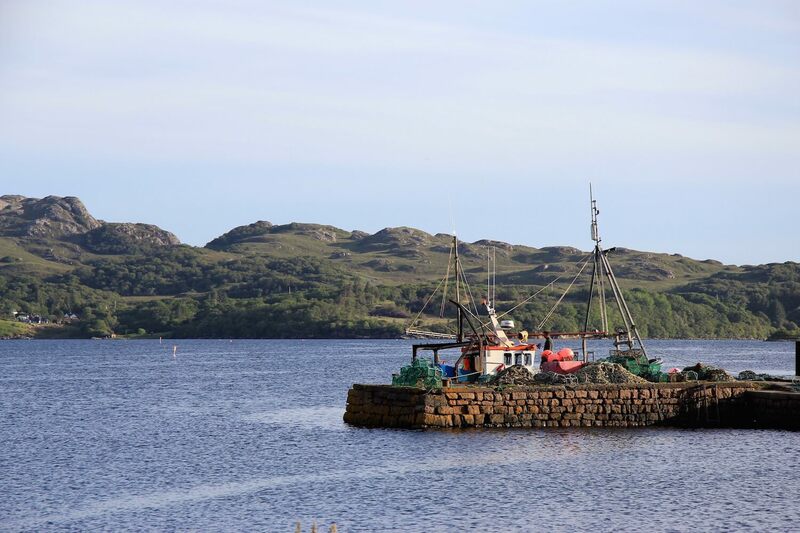 It’s not a place to spend a ton of time, but Lochinver is a really nice little village and a place called Lochinver Larder that is a great lunch spot. 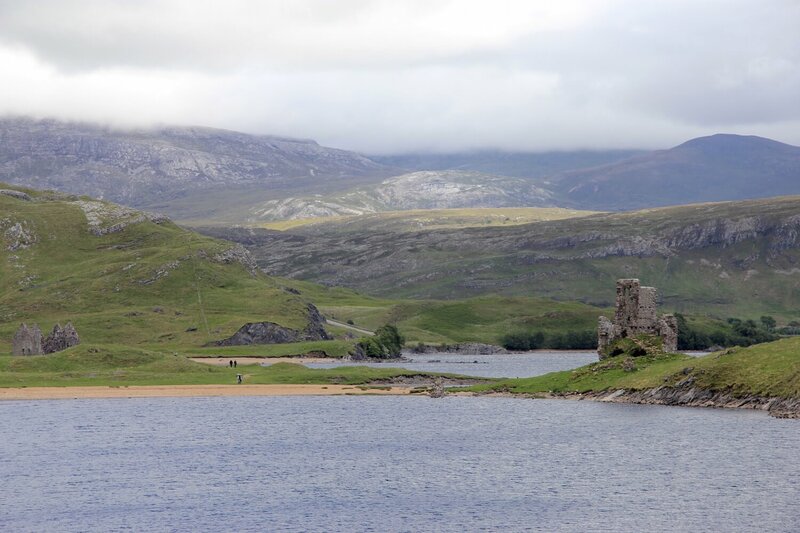 It’s in between Durness and Ullapool, but keep that in your back pocket as a lunch spot. 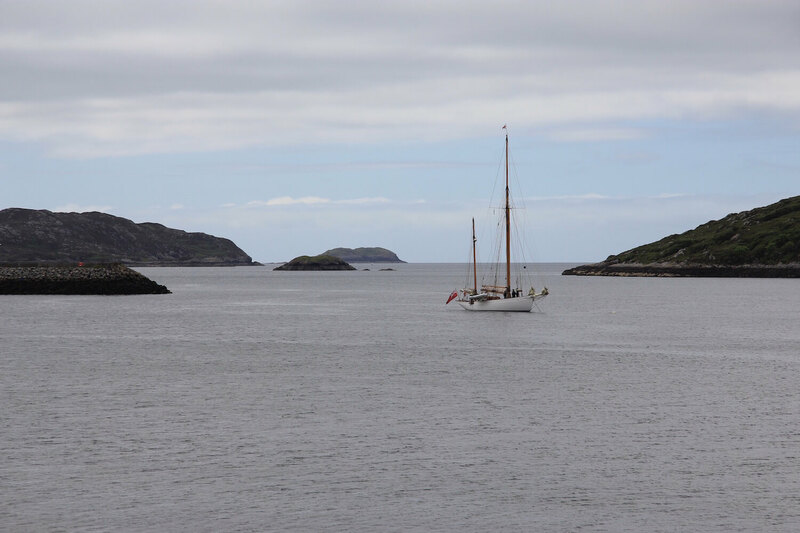 Just north of Lochinver is Kylesku and the famous bridge. There is supposed to be a really nice walk into the hills above the bridge the leaves from the overlook parking lot. You get the sense that I wish I’d taken more time away from the course – I’m glad you’re doing just that! Overall, I’d just plan to stop frequently at the overlooks, hidden beaches, and other areas to explore. If the weather gets bad, head into a local village for lunch and hunker down. I hope that helps a little bit! I purchased the NC500 ebook guide from their website and was happy I did – that’s a tip I need to add to the post above. Enjoy the trip and drop me a note saying how it went! I can’t thank you enough for the reply. We’re furiously scouring the internet and all of the above suggestions help focus our planning. 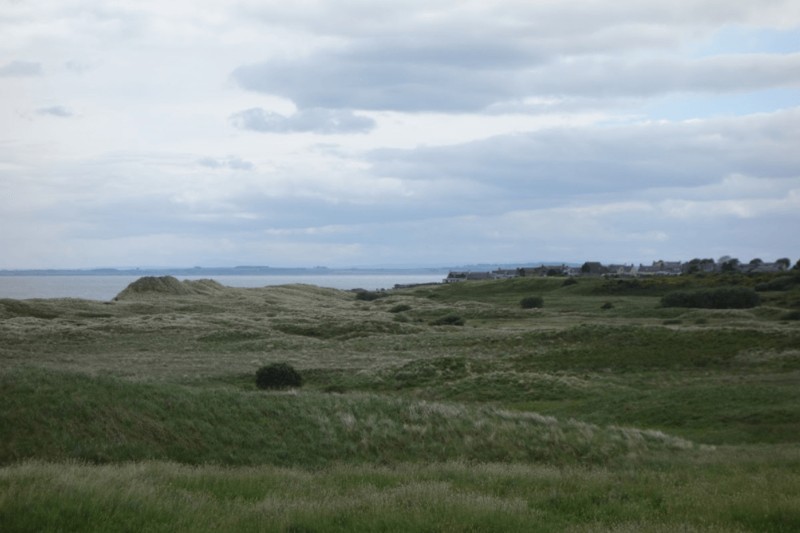 A couple of years ago I randomly ended up in Lossiemouth and played Moray, Old Course (IMO a hidden gem…to include the town) and it completely changed my perspective of what golf is/should be. 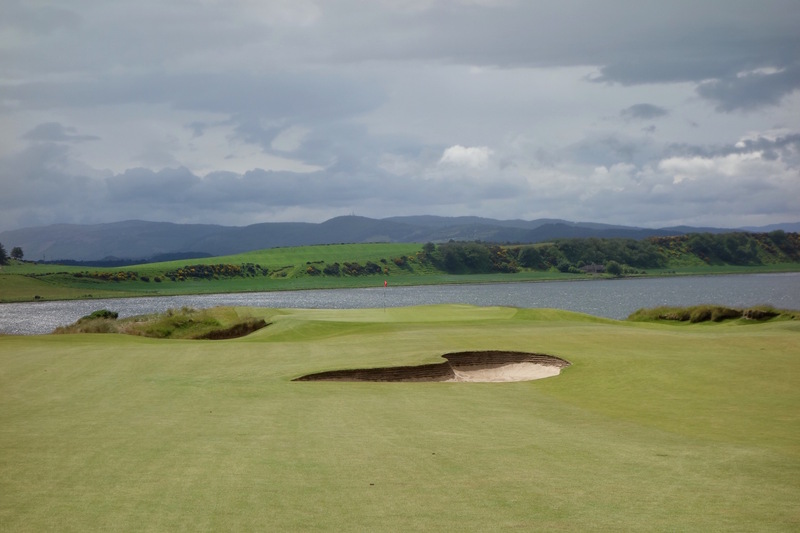 I’m enthralled with Scotland….golf (architecture), land and people and am taking every opportunity to return. Now that I’m a quick RyanAir flight away, I (and the family) will be taking many trips….to include Ayrshire at the end of March (fingers crossed for decent weather) and venturing outside of Scotland to South Wales in mid-June. I hope I don’t over-indulge and grow tired of links golf, but I highly doubt that. I’ll let you know how things turn out on our NC500 adventure. Thanks again! You give a nice taste of a fantastic area. Ben Hope would be a great Munro to tick off. One point I’d make is that Wick is a true hidden gem of a course. True out and back, and if they fixed the moss on the fairways nearest the club house it would be a no brainer to play. Sounds wonderful. Is it possible to hire a driver for the trip so that all aboard (4) could enjoy the scenery and be driven safely? Hi Bette, Great question! I’m sure it’s possible to hire a driver. A company called Woods of Tillicoultry comes to mind as an option for that. I would warn ahead of time though, it’s an expensive option because the driver’s accommodation is built into the larger fee. Could be worth it though for the North Coast 500!